Another year, another Iranian cartoon contest denying the Holocaust has been launched, as per this Times of Israel report. While the US lifts sanctions, Iran has escaped western condemnation for its tasteless and offensive antisemitism. Will the Jewish community leader have the courage to condemn the regime, as Haroun Yeshayaei did in 2006? I'm not holding my breath. 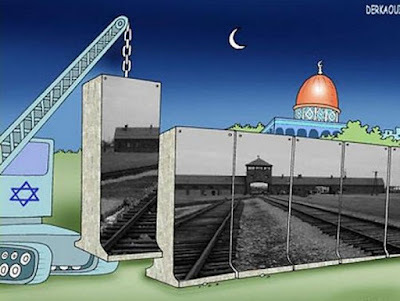 Iran plans to hold another cartoon contest focusing on Holocaust denial, and Israeli officials have called on the United Nations to condemn the event. The winner of the event sponsored by the Tehran municipality will receive a $50,000 cash prize. Organizers say the competition is designed to highlight the world’s double standard in defending caricatures of the Muslim prophet Mohammed, whose depiction is forbidden in Islam. The competition scheduled for June 2016 is expected to draw submissions from artists from some 50 countries, Iran’s semi-official IRNA news agency reported in December.